As you know, MJ and I often take LJ to go feed the ducks because it’s something to do and we actually have grown to enjoy it. Not only is it a great teachable moment for my toddler but it’s somewhat relaxing. Anyway, near the duck ponds are cow and sheep farms so we do hear the occasional “moo” or “baa” along with the “quack”. Well, on our way back to the car after an enjoyable session with the feisty ducks, we saw a strange figure near our car. Is it a dog? Is it a wallaby? Is it a cat? As we approached the car, we had a vague idea of what the moving object was and once we heard the clucking there was no doubt about it. There was a rooster near our car! 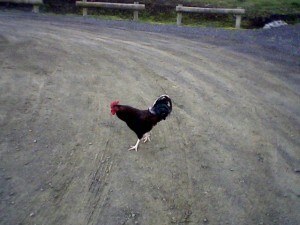 I had never experienced a stray farm animal cross my path let alone a rooster in a parking lot (car park in Australia). In NJ, I’ve crossed paths with squirrels and stray cats and dogs and ok, I’ll admit it, in seedy parts of a city, you can come across a stray rat but I never thought stray roosters would be added to my list. I guess there’s always a first time for something, especially in a whole different world of Australia. Share the post "Whole different world"